Need flexibility and have minimal space? The PMU-2300 thermal kiosk printer is the ideal solution for kiosk applications where space is a premium and flexibility is a must. 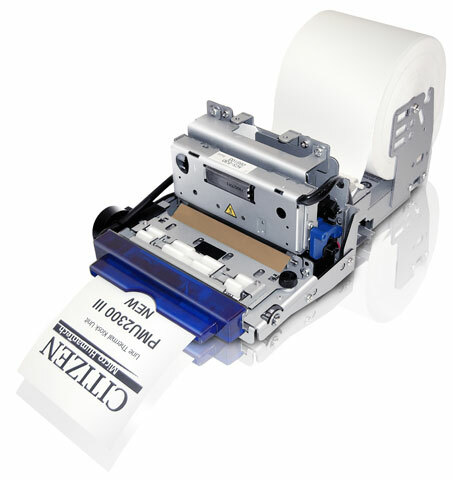 Based on the new high-speed LT-2220/2320 series thermal mechanisms, these little powerhouses feature a 3-inch wide mechanism, wider operational temperature range for outdoor use or fluctuating temperature environments, and a removable head design for easy head cleaning and quick paper jam removal. Small and compact, these units feature a blazingly fast print speed of up to 150 mm/second. The Citizen PMU-2300III-PBRSU is also known as Citizen America	PMU-2300III-PBRSU	or PMU2300IIIPBRSU	.